February whizzed by in a flash, what with my trip to B.C., but I am back on the program, so to speak, and planning my next e-interview. I'll be posting it in the following days. My next featured guest will be none other than Kelly Kilmer, artist-teacher extraordinaire, and operator of a very cool tool called Prompt-A-Day. It is meant to facilitate the journaling process, but I can see, along the vein of Illustration Friday, how it might be applied in a broader sense to ignite the creative process and bleed over, so to speak, to other creative applications. If you have been living in Southern California and involved in the mixed media art scene at all, you would be hard-pressed not to know who Kelly is (perhaps if you lived under a rock?). 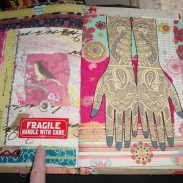 At the forefront of visual journaling as a viable form of artistic self-expression, she teaches folks all across North America to not only create the books which will become containers for these bits of self-expression, but also what to do with them in order to fill them up. Her recently formed Ning group, Prompt-A-Day, provides daily kernels of artsy how-tos and journal prompts, and a forum in which members of the group can share their resulting pages, and anything else they feel moved to share... all this goodness for $25 a month... cheaper than a daily cup of Starbuck's coffee, and in my humble opinion much more satisfying. Watch for the interview to be posted later this week!